Who knew you can have your 'greens' and have cake at the same time?! This moist cake is a great way to avoid dairy and eggs or to surprise friends and family with. Grease one 23cm (9 in) non-stick spring form cake tin. Line bottoms of tin with (non-bleached) parchment paper. If using gluten free self-raising flour, leave out the bicarbonate of soda, but follow rest of recipe. Add almond milk, vanilla extract and vegetable oil. Mix well. Add grated courgettes and mix until all is combined well. Divide the mixture evenly between the two cake tins. Bake for 30-45 minutes in a 180C/Gas 4 oven until you can remove an inserted cake skewer cleanly. i had to bake it for closer to 50 minutes, so checking regularly is needed. 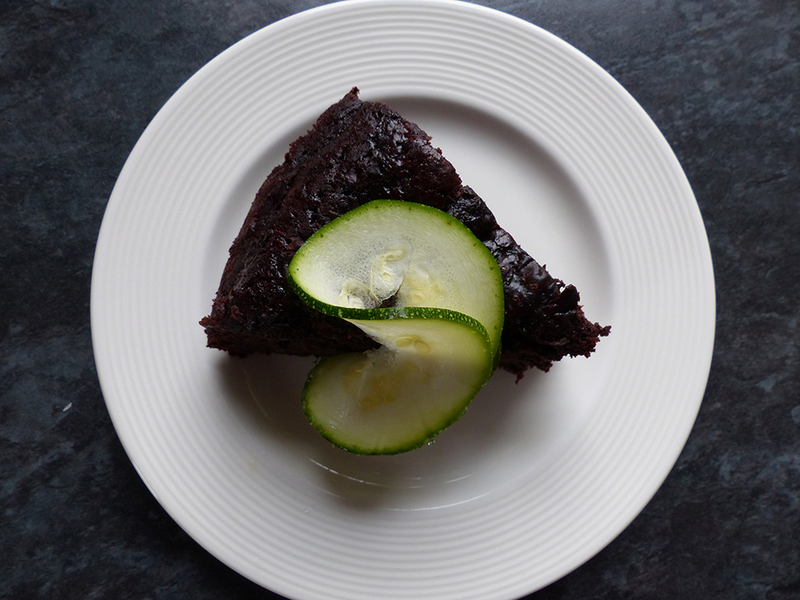 But it's worth it, this vegan chocolate cake is super silky on the inside because of the courgette! Leave the cakes to cool for 5 minutes in their tins then carefully remove the sides of the springform cake tins.